The Nikon D5200 is a fantastic DSLR camera that comes equipped with a 24.1 megapixel DX-format sensor, a sensitivity range from ISO 100 to ISO 6400 and the best in class 39-point AF system. These and other features such as flip out LCD come together to deliver high image quality and excellent performance. The camera also features the Scene Recognition System which adopts the 2016-pixel RGB sensor to bring you accurate scene brightness and colour information. The Nikon D5200 is equipped with a 24.1 megapixel DX-format sensor, a sensitivity range from ISO 100 to ISO 6400 and the best in class 39-point AF system to deliver high image quality and excellent performance. What’s more, the Scene Recognition System adopts the 2016-pixel RGB sensor, bringing you accurate scene brightness and colour information. The vari-angle monitor also offers full versatility to shoot from different angles and perspectives. Your image expressions are now more flexible than ever. Some moments deserve the very best image quality. The new D5200 delivers the most impressive 24.1 megapixel images, thanks to its EXPEED 3 engine - the same processor found in our flagship D4 model. With a wide sensitivity of ISO 100-6400 (expandable up to Hi-2 ISO 25600), the D5200 delivers great performance in all lighting conditions. Yet, you will be pleasantly surprised by the D5200's ease of use. Even if you are new to DSLR cameras, you will soon be shooting professional quality photos. For the utmost in flexibility, the D5200's large high-resolution LCD monitor flips out and swivels to just about any angle - giving you picture-perfect framing when shooting overhead, at low angles, in cramped spaces and more. A perfectly focused shot makes all the difference. The D5200's advanced 39-Point Autofocus gives you exceptionally precise focus, with sophisticated tracking and intelligent face detection. This makes it easy to create gorgeous portraits, beautiful background blurs and dramatic action shots. If you prefer to use the LCD monitor to frame your shots, just press the D5200's Live View button. In Live View, what you see on the ample 3"" screen really is truly what you get. You can quickly and easily compose your shot right down to the smallest detail. With the D5200, you don't have to be behind the camera to take incredible photos. Simply connect the optional WU-1a Wireless Mobile Adapter to remotely control the D5200 from your Android or iOS device 1,2. It is never been easier to put yourself in the shot. Connect the optional GP-1 GPS Unit to add location information to every shot, so you can remember where your most precious moments happened. The D5200's outstanding image quality lets you record Full HD videos with amazing clarity in a wide range of frame rates. Its autofocus tracking takes the guesswork out of keeping your moving subjects in focus. For extraordinary sound, the D5200 captures audio in stereo with its built-in microphone. With the optional Wireless Remote Controller, you can control your D5200 wirelessly from up to 20 metres away without interruption - outperforming infrared controllers. Simply connect the WR-R10 transceiver to the camera and control the shutter release with the WR-T10 transmitter. 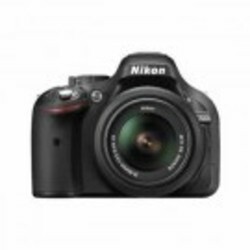 The D5200 is compatible with a wide range of NIKKOR lenses. From zoom lenses, to wide-angle lenses and more - with the D5200, the possibilities are endless.